Jer-Den Plastics offers a variety of secondary manufacturing services, including spin welding, to provide the quality rotational molded parts and finished products you need – rapidly and affordably. As a “value-added” supplier, we can lower your costs – and reduce your time to market – with our efficient in-house spin welding services. Spin welding is a method of joining thermoplastic parts using heat generated by high RPM rotational friction at the joint line. The spin welding machine rotates one part against a second stationary part – applying pressure axially. The heat resulting from the friction melts the parts together. When properly done the two parts almost become one part – and are often almost as durable as a single part. 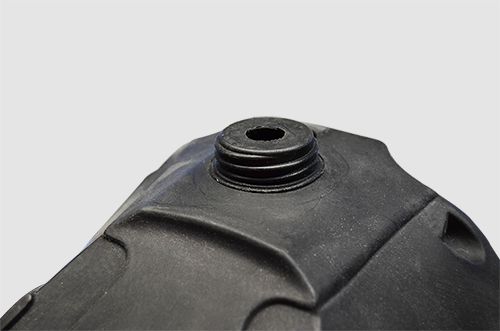 Additionally, the spin welded joint becomes “hermetically sealed” and is completely “leak free”. The spin welding process thereby eliminates the need for welded seams or rubber gaskets that will eventually degrade and leak. In addition to providing high quality durable joints, spin welding can lower your assembly costs. Spin welding utilizes only heat – no additional chemicals or adhesives – to join parts. And, because Jer-Den plastics offers spin welding in-house, it can also decrease your product production times. Virtually all thermoplastic materials are suitable for the spin welding process. And, plastic materials that are suitable for ultrasonic welding can also generally be effectively spin welded. Additionally, spin welding is an ideal solution for joining materials with poor ultrasonic transmission properties – including polyamide and polyolefin plastics. The two parts to be spin welded together must be molded of compatible materials. Typically we mold all of our parts that will be spin welded from high molecular weight Low Density Polyethylene – which we compound with select additives for superior adhesion and durability. When we handle your rotational molding project, we will consider any spin molding needs from the very first steps of engineering and testing your design. Because we are plastic manufacturing experts with years of experience, you can trust us to design and manufacture your components from the best and most appropriate materials for your spin welding needs. Our state-of-the-art spin welding equipment, our years of spin welding experience, and our highly skilled staff – ensure that your plastic parts will always be manufactured to your exact specifications. Additionally, our centrally located geographic location in the Detroit area allows us to efficiently deliver the assembled products anywhere in the Midwest – and on either coast – rapidly and cost effectively. If you have a specialized manufacturing requirement for rotational molding or spin welding services, our experienced engineers and plastic manufacturing professionals can design a custom solution to meet your unique needs.